The kidney bean is named for its visual resemblance to a kidney. It is characterized by a strong flavor and its reddish brown color. Kidney beans are very versatile. They are often used in chili, refried beans, soups, and salads. Kidney beans are an excellent source of potassium and some trace amounts of iron and calcium. While a true kidney bean is dark red/brown in color, a light red bean, phaseolus vulgaris, is often referred to as a light red kidney bean, owing to the similar shape and texture. Choosing: Whether purchasing kidney beans in bulk or in a packaged container, make sure there is no evidence of moisture or insect damage and that the beans are whole and not cracked. One of the most popular uses for kidney beans is in the preparation of chili. Along with chili, these red beans are a welcome addition to many casseroles, both for the flavor and the dash of color that the beans add to the presentation of the dish. 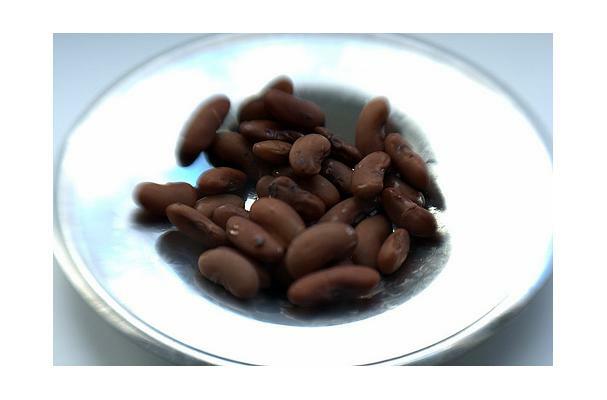 Cleaning: Before washing kidney beans, spread them out on a light colored plate or cooking surface to check for and remove stones and damaged beans. After this process, place the beans in a strainer and rinse them thoroughly under cool running water. Store dried kidney beans in an airtight container in a cool, dry and dark place where they will keep for up to 12 months. Cooked kidney beans will keep fresh in the refrigerator for about three days if placed in a covered container. Kidney beans are also a favorite in preparing refried beans, an excellent accompaniment to any Mexican style dinner. History: Subsequently, Spanish and Portuguese traders introduced kidney beans into Africa and Asia. As beans are a very inexpensive form of good protein, they have become popular in many cultures throughout the world. Today, the largest commercial producers of dried common beans are India, China, Indonesia, Brazil and the United States.